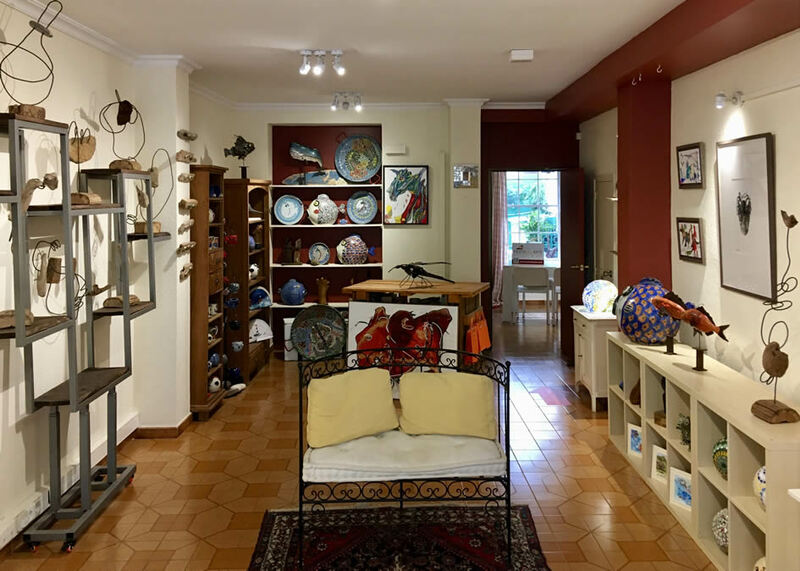 The Artist Studio and Gallery BROESCHEN on the Balearic Island of Menorca provides Courses and Workshop Abstract and Free Painting, Mosaic Trencadis and Foto Guide Tour. Also National and international artists with the opportunity to gain inspiration on Menorca throughout the year of painting, mosaic, ceramics and high quality jewelry. Variety is provided by seasonal sculptures using the materials metal, stone or wood or alsophotography. The exhibition space of around 70 sq. m provides enough space for creativity, relaxation and inspiration. The Gallery Shop with worldwide shipping and direct sale by the Artist with more offers and price advantage. 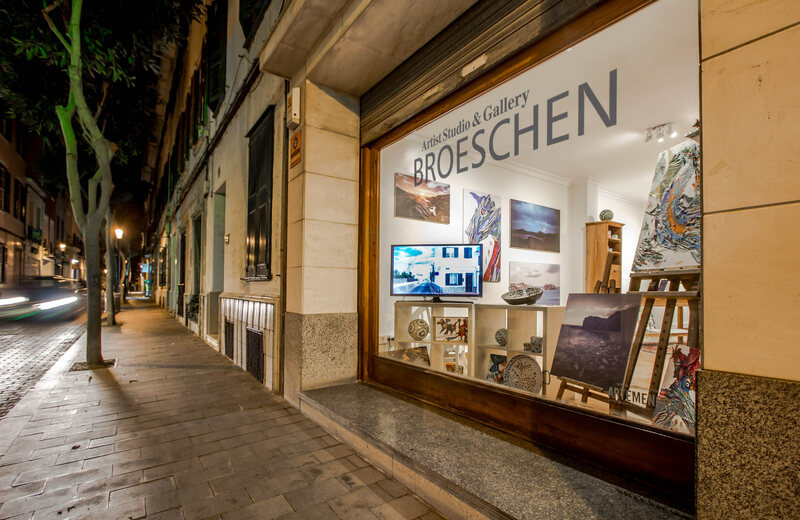 Gallery BROESCHEN is a producer´s gallery. The production and sale of paintings from the artist Anke Carola Broeschen (abstract and free painting on canvas, wood or paper and collage painting) in addition to the representation of national and international artists from the fields of photography, sculptures, ceramics and painting. In this workshop you will learn the so-called Trencardis mosaics techniques invented by Antonio Gaudí. We will work with cut and broken pieces of tiles and porcelain shards as well as original beachglass-pieces from Menorca to create unique new designs and individual indoor and outdoor decorations. Creative support and stimulation will be provided to achieve a creation of your own mosaic design. Price per Person includes mosaic material.You can take your artwork with you as a great individual souvenir of art. Groups pleaseask an offer.Course times individual ! Holiday House visit possible with Course inyour Garden ! In this 10-hours Abstract Painting Workshop you will learn the fundamental techniques of Collage Free Painting on canvas. Textiles and Fashion Material will be fixed on the canvas with glue. The canvas will be individually framed with a wooden framework during the course. Material such as Cloth, scraps of clothing, bonding agent, acrylic paint, oil pastel, ink and chalk. Will be utlised in my unique technique to bring collage and painting together on the canvas in this free painting art course. The textile material will be stuck on a canvas of circa 35 x 55 cm. Arcylic colours will then be painted on the canvas and textiles and spread out using a spatula. The short time it takes for the collage to dry allows for you to break away from the norms and regulations.Abstract figures will now become visible to the exterior eye as well as the interior. A form of communication will take shape. The object will then be slowly encircled on the canvas using a base colour. Withshades of colour and their harmony you will learn to transform abstract shapes into figures and faces. Your imagination enters the foreground. The stuck-together textiles form their own movement. The utilisation of acrylic colours rework and estrange the first impression of the painting and turn the object into a story. The objects on the canvas will then be connected using a line-technique.We will accompany you through thoughts, expressions and your individual vision. Price per Person includes material.You can take your artwork with you as a great individual souvenir of art. Groups please ask an offer.Course times individual ! Holiday House visit possible with Course in your Garden ! The artist Anke Carola Broeschen was followed by private tutoring in abstract and free painting from the stage designer (mentor) Andreas Szalla in Bochum, Germany, Zurich, Switzerland and at the Salzburg Festival between 2000 and 2007. In the summer of 2005, she travelled and held her first vernissage on the island of Menorca. The island promotes the creativity of the artist with its light and the intensive colours. Faces and figures carved in rock stimulate the imagination and additional impressive moments are to be discovered in nature, these then being transferred to canvas or paper. The works of art of the artist Anke Carola Broeschen have now been produced on the Island of Menorca and nationally and internationally exhibited since 2009. The opening of the gallery in Mahón now makes it possible to exhibit works of art on Menorca. The diversity and pastel coloured light in the sky and the ocean, the nature and the sea, combined with relaxation and serenity are what provide an enormous inspiration. Material that comes from the nature and the coast for example, are included in the collages, as are shards and ceramic included in the mosaics. Bendita Kanalla designs and creates clothes for the littlest ones in the family and everything is completely handcrafted. Enjoy the organic Shirt collection and exclusive the Gallery Fish BiniBini and much more, for babies, boys and girls. Her pieces are always fun and colourful, with details that make them unique and special. I was born in Barcelona and graduated from “Universitat de Barcelona” in fine arts and I have lived in Menorca since 1998. During 1997 I achieved my first painting award the “Sa Nostra”.I have shown in several exhibitions in “Galería Artara” in Maó and in “Sala del Roser” inCiutadella. I have kept myself updated with visual arts, specifically with the world of media,(video, photography, film), however I have always enjoyed painting. In addition I have thecraftsman´s letter from “Consell Insular de Menorca” that allows me to participate in artisian markets here on the island as an artist. The work of Jacint Alsina is aimed at young children. They are all toys that bear his signature. They are wooden puzzle, hand-made, which are notable for the variety of colors and shapes. We can find from the most diverse motives typically to animals menorcans, as a "caixer" riding his horse. For the BROESCHEN Gallery is made exclusively of Menorca fish, "BiniBini". The ecological value of the same, should add to the educational value of these juguetaes are pintades with non-toxic products. Jacint Alsina has the master craftsman certificate in gaming and entertainment. The collages by Alfredo Quintana Garay (1974), Tintorera, are debtors of Dadaism and Surrealism, as well as the romantic spirit of the nineteenth century, all of this agitated with the pop culture consumed over the years. Alfredo started making collage in the 90s, when he was studying Communication Sciences in Mexico. Originally, he worked in a traditional way, cutting and pasting images of different bibliographic findings. In 2001 he published the poetry plaquette Primavera de carroñas that he illustrated with collages; at the same time he began to assemble objects in the tradition of artists such as Joseph Cornell. Since 2013, after a period dedicated to the publication of a magazine, he took up the artisan collage and decided to experiment with digital. The reading of Poesía y fin de siglo and El arco y la lira, by Octavio Paz, led a young Quintana Garay to discover the surrealists and other determining poets for his vision of the world. Artists such as the Czech Jindřich Štyrský, René Magritte, the Dadaist Hannah Höch and Max Ernst have been permanent influences, as well as the music of Nurse With Wound and Pérez Prado. The –convulsive– beauty, chance and dreams are preponderant themes in his collages. In the same way, love and insomnia complement the daily torments that nourish the work of Tintorera. Among his future challenges is learning to apply painting, drawing and other materials in his collages, as well as giving more workshops in San Miguel de Allende, CDMX and Spain! For now, Alfredo works on two books of poems illustrated with collage, The Nine Muses of the Apocalypse and ABCDelirio. The first is a tribute to women inspired by actresses like Hedy Lamarr and Winona Ryder. The second is an alphabet with collage –accompanied by a poem for each letter– using words that begin with the letter in question. The collages of Tintorera have been published in magazines such as Tapas (Spain), Esquire Mexico and Latin America, Mens Health en Español and Forbes (Spain). My name is Antonio Vico. I started to work in ceramics in 1989, and independentlyfrom 1992 by assisting to courses of raku, silkscreen, ceramics and enamels settingsto high temperature. In 1992 I had my first exhibition which reflected all thesetechniques, I also participated in numerous solo and group shows, always in Menorca.Within the register of trades in the Balearic Islands I have the Charter of MasterCraftsman and my work is recognized by the "Consell Insular de Menorca" with theQuality Assurance Framework .My products are marketed through different shops on the island and Barcelona and during the summer in some craft markets. I also do custom work for associations and various groups.For the Gallery BROESCHEN are produced exclusively the ceramic fish models BiniMini and BiniBini. Born in Cali, Colombia,studied Media and a postgraduate in Audiovisual Practices at the Universidad del Valle (Colombia). He also did postgraduate studies in Audiovisual Communication at the Universitat Autónoma de Barcelona. In 2010 he won the Call for Art of Change of the Foundation Obra Social La Caixa with the Project Aprendiendo con el Cine, directed to young gypsies of the barri La Mina de Barcelona. He has done, among others documentary films, Vurma (2011), La Mirada Impúdica (2005), Historia de Juan (2002). His latest work, Variaciones Vurma (2016) compiles videocreations made between 2010 and 2014. Emanuele Mattarucchi is an italian craftsman based in Minorca for almost a decade. His studies in the construction of theatrical and cinematografic sets have been complemented by his self-taught passion in the realization of puppets, automatas and all sorts of gatgets powered by mechanisms. Eclectic artist, influenced by different experiences and places. It is in South America where he starts making jewelry with simple and manual processes. Later, at the School of Art in Mahón, where he studied, focusing on noble metals and precious stones. Later it will be formed in stone setting in Germany and engraving in Tiznit, Morocco. He always works in the search of duality, mixing organic and geometric forms, pure lines and complex textures. Since 2011, he has his base camp in Menorca where he has been working in handmade markets in the Balearic Islands, and interacting with different artisanal associations. The island promotes the creativity of the represented artists with its light and the intensive colours. Faces and figures carved in rock stimulate the imagination and additional impressive moments are to be discovered in nature, these then being transferred to canvas or paper. The diversity and pastel coloured light in the sky and the ocean, the nature and the sea, combined with relaxation and serenity are what provide an enormous inspiration. The island of Menorca offers inspirations and ideas such as vibrant sunsets, the permanently changing colour of the ocean, from turquoise to emerald green and deep blue shades, and the sandy beaches and rocky limestone rocks. The artists who are represented by the Artist Studio & Gallery BROESCHEN are not the first generation to be inspired by the impressive landscape of the Balearic island. Art in all its forms already originated decades ago, when hippies and artists discovered the Balearic Islands (Menorca, Majorca and especially Ibiza). Nowadays, the Gallery determines the free painting, abstract art and photography. 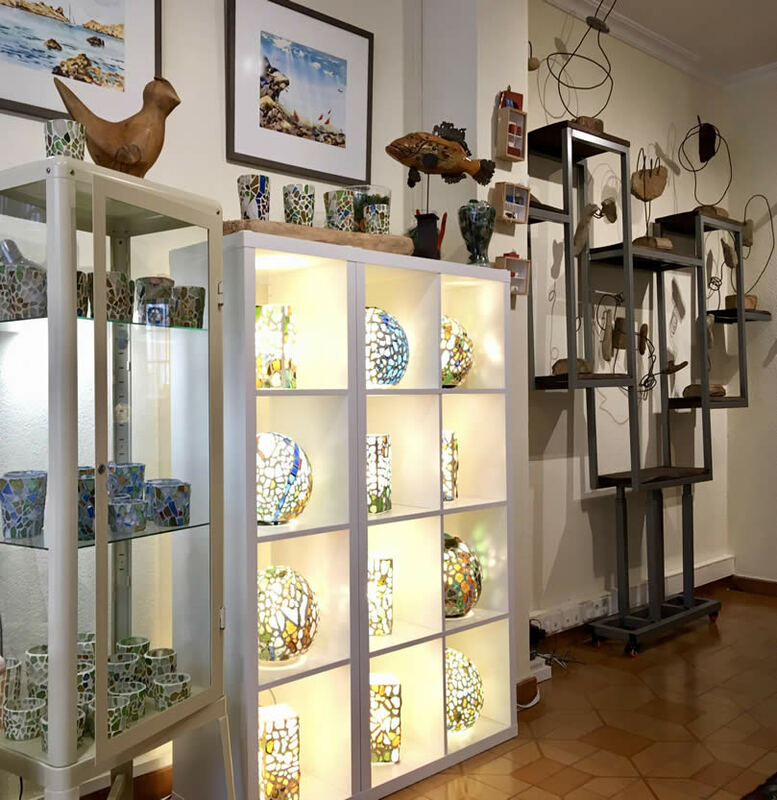 We also create mosaics (in the tradition of the Spanish master Gaudí ), ceramic art and artworks using glass shards before offering them to all of the art aficionados in the world. Let yourself be inspired and visit us on Menorca.